Bush Urges Curbs on Greenhouse Gases by 2009 The United States will engage in new international negotiations to reduce greenhouse-gas emissions, according to a plan President Bush announced Thursday. The president heads to Germany next week to discuss climate change with other world leaders. The United States will engage in new international negotiations to reduce greenhouse-gas emissions, according to a plan President Bush announced Thursday. The president heads to Germany next week to discuss climate change with other world leaders. The U.S. will reengage in international negotiations to reduce greenhouse gas emissions. President Bush made that announcement today, just a week before he heads to Germany to talk about climate change with other world leaders. ELIZABETH SHOGREN: Soon after President Bush took office, he took the U.S. out of the Kyoto Protocol. That agreement is supposed to reduce the greenhouse gas emissions that are causing global warming. 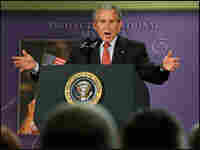 Now, President Bush says the U.S. wants to be a leader in figuring out what to do after Kyoto expires in 2012. President GEORGE W. BUSH: My proposal is this, by the end of next year, America and other nations will set a long-term global goal for reducing greenhouse gases. SHOGREN: The president says he'll convene a series of meetings with the nations that emit the most greenhouse gases, including China and India, and come up with a target. Pres. BUSH: In addition to this long-term global goal, each country would establish midterm national targets. SHOGREN: The president did not say what the U.S. target would be, but he clearly wants to change the impression that he's blocking efforts to fight climate change. He says the solution lies in promoting innovation. Pres. BUSH: The way to meet this challenge of energy and global climate change is through technology, and the United States is in the lead. The world is on the verge of great breakthroughs that will help us become better stewards of the environment. SHOGREN: Such as plug-in cars and new ways to burn coal more cleanly. The president's top environmental advisor, Jim Connaughton, says the White House still opposes setting emission caps and allowing companies to trade the right to pollute. These cap-and-trade programs are supposed to create financial incentive for companies to clean up. Mr. JIM CONNAUGHTON (Chairman, Council on Environmental Quality): We've been very concerned about cap-and-trade proposals, largely on the grounds that they have tended, in the context of climate change, not to work very well. SHOGREN: The president's announcement comes after weeks of tensed diplomacy over climate change. Next week, President Bush is scheduled to meet with the leaders of the world's industrial powers at the G8 summit - Germany is hosting. And leaked documents show European governments want to commit to cutting greenhouse gas emissions in half by 2050. The documents show the U.S. opposes the idea. Mr. HANS VEROLME (Climate Director, World Wildlife Fund): The White House has been blocking progress in these talks for weeks now. SHOGREN: Hans Verolme from the World Wildlife Fund is in Berlin. He calls the president's new proposal a delay tactic. Mr. VEROLME: I think this is more of a diversion than a conversion, and moreover, the process that the White House is proposing is actually casting a long shadow over the climate process that the U.N. has started. SHOGREN: That United Nations process is working on an agreement to replace the Kyoto Protocol. At the White House, Jim Connaughton says the president's plan won't get in the way of the U.N.
Mr. CONNAUGHTON: What we're doing instead is saying, no, let's speed up the clock and in the next 18 months, see if we can get agreement on the basic elements of this framework. If you do that, then the U.N. process actually has something to chew on. SHOGREN: The president did get some unexpected praise from a lawmaker who is almost always a critic. Senator Barbara Boxer is a Democrat. She heads the Senate Environment Committee. Senator BARBARA BOXER (Democrat, California; Chairman, Senate Environment Committee): If this is what I hope it will be, which is a major summit with major players convened by this president, I believe it's the start of a whole new ballgame. If this is simply just something for show, then it won't be. But at this point, I'm very optimistic. SHOGREN: She was happy to hear the White House opened the door to action on climate change. But not all of the president's appointees are sure action is needed. Even as the president was making his announcement, White House officials had to answer questions about comments made by the head of NASA. Administrator Michael Griffin told NPR he wasn't sure climate change is a problem. Read President Bush's statement on greenhouse gases and the administration's international agenda. Listen to NPR's interview with NASA administrator Michael Griffin in which he says he "can't say" if global warming is "a long-term concern or not." Listen to an interview with Jim Hansen, NASA's top climate change scientist at the Goddard Institute for Space Studies, and his reaction to the comments by Griffin. President Bush unveiled a long-term strategy for dealing with climate change Thursday, ahead of the annual G-8 summit next week where the issue will be at the top of the agenda. The president urged 15 major industrial nations to reach an agreement by the end of next year on goals for reducing greenhouse-gas emissions globally. The plan marks a major shift for a president who, six years ago, downplayed the issue of climate change. Yet critics say the plan announced Thursday is vague and doesn't go far enough. European nations accuse the U.S. of foot-dragging on an issue that affects virtually everyone in the world — and they are calling for a much more aggressive approach. For instance, Germany has proposed a "2-degree" target, whereby the goal is to hold global warming to no more than a 2 C (3.6 F) increase from pre-industrial temperatures. Experts say achieving that goal would require a dramatic reduction in emissions by 2050. President Bush has rejected that proposal and is now calling on nations to set a global emissions goal, leaving each nation to decide how to reach that goal. The details of the plan will be decided in a series of meetings beginning this fall, the president said. "The United States takes this issue seriously," Bush said. "The new initiative I'm outlining today will contribute to the important dialogue that will take place in Germany next week." But Tony Juniper, head of the environmental group Friends of The Earth, said Bush's announcement serves as a delay tactic. "This is a deliberate and carefully crafted attempt to derail any prospect of a climate change agreement (at the G8 summit) in Germany next week," Juniper said. "He is trying to destroy the prospect of that getting anywhere by announcing his own parallel process with very vaguely expressed objectives." The Bush administration has rejected other proposals for controlling climate change. It does not support global carbon-trading programs that would allow countries to buy and sell credits to comply with carbon dioxide standards, an approach that has been attempted with other types of pollution. The White House also has rejected energy-efficiency targets advocated by the European Union, arguing that a standard that makes sense for one country does not necessarily make sense for another. James Connaughton, chairman of the White House Council on Environmental Quality, said the United States is not against setting goals but prefers to focus on specific sectors, such as cleaner coal and reduced dependence on gasoline. "The U.S. has different sets of targets," Connaughton told the Associated Press. In recent years, climate change has progressed from a fringe issue in the United States to one of major concern to Americans, according to polls. But, as the president unveiled his plan Thursday, NASA administrator Michael Griffin questioned whether global climate change is even a problem and whether it deserves international attention. "I have no doubt that ... a trend of global warming exists," Griffin said during an interview on NPR's Morning Edition. "I am not sure that it is fair to say that it is a problem we must wrestle with. To assume that it is a problem is to assume that the state of Earth's climate today is the optimal climate, the best climate that we could have or ever have had and that we need to take steps to make sure that it doesn't change." His comments elicited disbelief from Jim Hansen, NASA's top climate change scientist. "I nearly fell off my chair (when I heard the comments)," he said during an interview on NPR's Day to Day. "It's remarkably uninformed about the status of our understanding (of climate change)," he added.